I've always thought this half-helmeted conversion was a cool look. It really only worked with Grey Knight Terminators though due to the way their helmets were constructed. This one was done to a metal model which was tough to do, but now that the new plastics are out, this conversion should be a piece of cake to pull off. The idea originally came from the back of the old Daemonhunters codex. There's a model done by John Blanche that has this conversion done to it. I swore I would do it to one of my models one day if I had the chance. When I had the opportunity to build a few Grey Knight terminators a while back, I knew I had to try this out. Using the old metal models made it tough to do, but not impossible. Some careful filing and test fitting until I had both parts married together. The new plastic pieces should make the fitting much easier. You need to cut a way a good portion of the head and leave really only the nose upward showing. Even then, you cut off the bottom of the nose as well. You want this guy to be peering over the bottom portion of his face mask. The lower portion of his helmet is much higher than a normal collarpiece would be and covers a good bit more of his face. Make sure to leave the back helmet vents in place as they frame out the top of the head nicely and give the illusion that the head is set down in there. You may have to cut away a small portion of the back of the head to get it to fit on there, but that should be no problem. And you can do this with just about any bare head out there. Having hair on there might be a bit tough to pull off, but any bare head should work just fine. hey! again , not a 40 k fan here.. but i do like ur blog, ur very creative!! nice idea! The John Blanche model was a red-painted Grey Knights Terminator (page 48 under the 'Showcase' section) of the old Daemonhunters codex a.k.a. '2nd' ed GK codex. I still have that book! I would argue because of the cooler shade of colour scheme, your conversion looks better (the half-head 'pops' out more). That's amazing work there Ron. You want to do me half a dozen, right? Anvil Industry sells Grilled heads which are very similar to the Hal-helmet look you want. However, I'm gosh-darn certain the person that did this conversion made a guide alongside it. That looks great, I really do think that its the head that makes a model look "right". nice work Ron. What a simple yet effective conversion, Ron! As always, fantastic job! 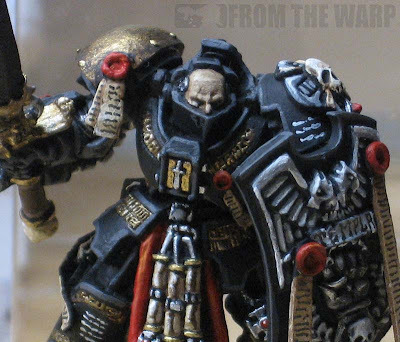 I agree with Menzies Tank that your paintjob is more suited to the model than JB's: I actually had to go and double check in Codex Witchhunters that the model actually has a half-helmet: It had never occured to me before, due to the rather busy paintwork. Ron, that looks great! What do you use to cut with? Dremel? Menzies Tank: You bring up a good point about the contrast of the cool armour and warm skin tones. Painting it today (knowing what I know now), I would have pushed that effect further for the contrast. Faolan (Jake): I've got one and that's plenty for me. I can't be responsible for the urge to make a unit like this. Narric: I haven't seen those heads yet. As for the picture above... I never made a tutorial for it since it's an older model of mine. I thought I might dig it up and finally share it. If I had a plastic helmet, I would have tried it on a new one myself again. james fenton: Thanks. It's a focal point on most models and I try to add as much detail there as possible since I cut corners elsewhere. KrautScientist: Nice work digging up the Sisters of Silence reference there. Green Stuff Industries: Thanks. The bulk of the cutting was done with an X-Acto blade and the fine tuning was done with a file until both halves married up perfectly. Oh no Ron, I hold you personally responsible for all urges you cause me to have. It's not MY fault, it's yours. And society, of course. But never me. Drkmorals: Let me know how it goes if you're using the new plastics. Anon and Man Boy Genius: Thanks! Fuzzbucket: Very nice work Sir! This is a really original idea, I'm going to use it to build my BT Marshall's head. :D Thanks for the inspiration. Dangermouse425: I could see this conversion on a Templar Marshal. It would fit their theme pretty well I bet. The building is now the new watchword for construction around the world. I have been messing around with this technique since reading this article. Here some of my initial progress.